President Obama: "People are... hurting. 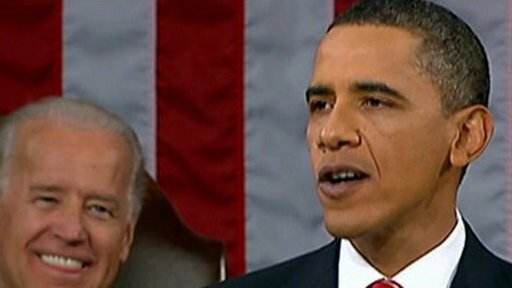 They need our help"
US President Barack Obama has said in his first State of the Union address that creating jobs must be the nation's number one focus. Mr Obama accepted Americans were "hurting" and that his election pledge of change had not come quickly enough. He defended his healthcare reform efforts and bank bail-out policy, but said there would be a spending freeze from 2011 to tackle the budget deficit. Bob McDonnell, for the Republicans, criticised the expansion of government. The Virginia governor said the federal government was "simply trying to do too much". Mr Obama was given the traditional warm welcome by all sides of Congress and received several standing ovations. He opened his address by saying the US had to "answer history's call". On the issue of employment, Mr Obama said: "People are out of work. They are hurting. They need our help. And I want a jobs bill on my desk without delay. "Jobs must be our number one focus in 2010." On the economy, Mr Obama said he had taken office a year ago "amid two wars, an economy rocked by severe recession, a financial system on the verge of collapse, and a government deeply in debt". "The devastation remains," he said. "One in 10 Americans still cannot find work. Many businesses have shuttered. Home values have declined. Small towns and rural communities have been hit especially hard. For those who had already known poverty, life has become that much harder. "I know the anxieties that are out there right now. They're not new. These struggles are the reason I ran for president." He said he would insist on the new jobs bill. "The House has passed a jobs bill... as the first order of business this year, I urge the Senate to do the same." Mr Obama defended the controversial bank bail-outs, saying they were necessary to save the economy. "When I ran for president, I promised I wouldn't just do what was popular - I would do what was necessary," he said. "If we had allowed the meltdown of the financial system, unemployment might be double what it is today. More businesses would certainly have closed. More homes would have surely been lost." But he said the budget deficit had to be tackled. "Starting in 2011, we are prepared to freeze government spending for three years," he said. President Obama also tackled lobbying. He had openly criticised last week's ruling by the Supreme Court rejecting long-standing limits on how much companies can spend on political campaigns. His words brought a reaction from Supreme Court Justice Samuel Alito, who shook his head and appeared to mouth the words, "No, it's not true". The president also talked about global warming, urging the Senate to "advance" work on climate change, while acknowledging deep disagreement on a bill to cap carbon emissions. 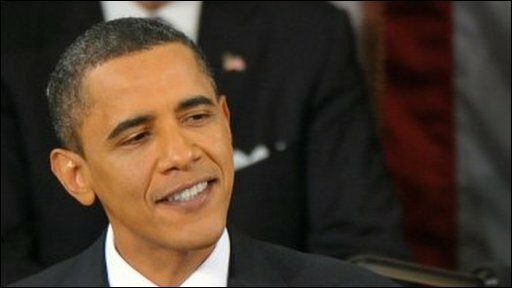 On healthcare, Mr Obama said he took his share of the blame for not explaining the situation better. But he said many Americans were losing their insurance, adding: "I will not walk away from these Americans, and neither should the people in this chamber." On security, Mr Obama said the war in Iraq was ending and "all of our troops are coming home". He said increased US efforts in Afghanistan would help the Afghans start taking the lead in 2011. International allies had also stepped up their commitment, he said, and would use Thursday's Afghan conference in London to "reaffirm our common purpose". "There will be difficult days ahead. But I am confident we will succeed," he said. Mr Obama also referred to a replacement for the Strategic Arms Reduction Treaty (Start), saying the US and Russia were completing negotiations on the "farthest-reaching arms control treaty in nearly two decades". He also announced he would tackle the controversial law that bars openly gay people from serving in the military. Obama's problem is not with his speech-making. The problem is that his policies have been, to date, a complete failure. He said: "This year, I will work with Congress and our military to finally repeal the law that denies gay Americans the right to serve the country they love because of who they are." He ended the speech with the words: "We don't quit. I don't quit. Let's seize this moment - to start anew, to carry the dream forward and to strengthen our union once more." The BBC's Richard Lister, in Washington, says it was a sober speech for serious times, primarily devoted to domestic issues. He says the president talked optimistically about the capacity of the American people to endure hardships, and come through stronger, but at times he also sounded defensive, saying he never suggested he could bring the change he promised all by himself. Republican Bob McDonnell said that despite rising unemployment, the Democratic Congress continued "deficit spending, adding to the bureaucracy, and increasing the national debt". "The amount of this debt is on pace to double in five years, and triple in 10," he said. "This is simply unsustainable. The president's partial freeze on discretionary spending is a laudable step, but a small one. "The circumstances of our time demand that we reconsider and restore the proper, limited role of government at every level." Republican Senator and former presidential candidate John McCain said he was surprised Mr Obama still wanted to push ahead with a comprehensive healthcare overhaul. "What I thought he would have said was 'Look I hear the message from the Massachusetts election, now let's start over'. Frankly, that would've put the burden on us," he said. Mr Obama's address follows the Democratic Party's loss of a key Senate seat in Massachusetts last week which has deprived them of their filibuster-proof 60-seat majority in the Senate. The loss puts in danger the president's sweeping legislative agenda he set out after taking office a year ago.